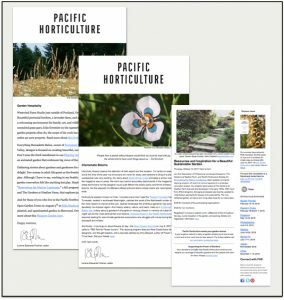 Pacific Horticulture’s monthly e-newsletter is your plant portal to more than 1,000 archived stories about West Coast gardens and gardeners. Be the first to know about upcoming PHS tours and open garden events, and receive additional online-only content. Complete this form to sign up for our newsletter and we’ll email you a free copy of Changing Times, Changing Gardens, a resource guide to creating beautiful, resilient gardens.